Objectives To explore ethnic differences in changes in body mass index (BMI) from the age of 18 years to 3 months postpartum. Design A population-based cohort study. Setting Child Health Clinics in Oslo, Norway. Participants Participants were 811 pregnant women (mean age 30 years). Ethnicity was categorised into six groups. Primary outcome measures The outcome variable was BMI (kg/m2) measured at the age of 18 and 25 years, at prepregnancy and at 3 months postpartum. Body weight at 18 years, 25 years and prepregnancy were self-reported in early pregnancy, while body height and weight at 3 months postpartum were measured. The main statistical method was generalised estimating equations, adjusted for age. The analyses were stratified by parity due to ethnicity×time×parity interaction (p<0.001). Results Primiparous South Asian women had a 1.45 (95% CI 0.39 to 2.52) kg/m² higher and Middle Eastern women had 1.43 (0.16 to 2.70) kg/m2 higher mean BMI increase from 18 years to postpartum than Western European women. Among multiparous women, the mean BMI increased 1.99 (1.02 to 2.95) kg/m2 more in South Asian women, 1.48 (0.31 to 2.64) kg/m2 more in Middle Eastern women and 2.49 (0.55 to 4.42) kg/m2 more in African women than in Western European women from 18 years to prepregnancy. From 18 years to postpartum, the mean increase was 4.40 (2.38 to 6.42) kg/m2 higher in African women and 1.94 to 2.78 kg/m2 higher in the other groups than in Western European women. Conclusions Multiparous women of ethnic minority origin seem substantially more prone to long-term weight gain than multiparous Western European women in Norway. This multiethnic population-based cohort study of pregnant women had relatively high participation rates and was representative of pregnant women in the study area. To ensure high quality of the data, study questionnaires were available in nine languages and professional interpreters assisted in the interviews when needed. The main analyses were adjusted for age as a time-dependent covariate, and the additional analyses among multiparous women were adjusted also for parity. The main limitation is that body weight data at the age of 18 and 25 years were retrospectively self-reported in early pregnancy. The African, East Asian and Eastern European groups had quite a small number of participants. Higher parity has been associated with slightly higher mean body mass index (BMI) in women in different countries19 20 which can be partly explained by postpartum weight retention. We have previously reported that some ethnic minority groups gain more weight during pregnancy21 or retain more weight postpartum on average22 compared with Western European women which might partly explain ethnic differences observed in the prevalence of overweight and obesity in the general adult female population. Longitudinal studies of BMI in multiethnic populations are required to detect whether ethnic minority women are at higher risk for long-term weight gain. This will help to plan timely interventions to prevent weight gain that may increase the risk of non-communicable diseases. The aim of this study was to model the change in women’s BMI from the age of 18 years to 3 months postpartum by ethnicity in a population-based cohort of pregnant women (mean age of 30 years). The present study used data from a population-based cohort study consisting of pregnant women who attended antenatal care at Child Health Clinics in three city districts of Oslo, Norway.32 In these districts, approximately 60% of newborns were of non-Western ethnic origin and 75%–85% of pregnant women used antenatal care at these clinics at the time of the study. To fulfil the inclusion criteria for the study, pregnant women had to live in one of three city districts in Groruddalen, plan to give birth at one of the two study hospitals, be at ≤20 weeks’ gestation, be able to communicate in Norwegian or any of the eight languages to which all the information materials and questionnaires were translated (Arabic, English, Sorani, Somali, Tamil, Turkish, Urdu and Vietnamese), and be able to give informed written consent. Exclusion criteria were prepregnancy diabetes or other chronic diseases requiring intensive hospital follow-up during pregnancy (eg, known pregnancy complications or severe psychiatric conditions), or if they had participated in the same study during a previous pregnancy lasting ≥22 weeks. A total of 823 women were enrolled at 15 weeks’ gestation on average between May 2008 and May 2010. The overall participation rate was 74% among the eligible women, but it varied across ethnic groups (Western European 82%, Eastern European 75%, South Asian 73%, Middle Eastern 65%, African 64% and East Asian 63%). Women from South and Central America were excluded from the analyses due to a small number (n=12). The final sample size was therefore 811. Our participants were healthy pregnant women. They were not involved in the design of the study. The results of the study will be disseminated to the participants via STORK Groruddalen study website. The data were collected by trained, certified study midwives who interviewed the participants, filled in the questionnaires and obtained the objective measures at the Child Health Clinics at inclusion (mean 15 weeks’ gestation) and approximately 3 months postpartum.32 Whenever a participant was not fluent in Norwegian, professional interpreters assisted during the interviews, using the translated versions of the questionnaires, to ensure consistency in translations. The main outcome of the present study was BMI (kg/m2) measured at the age of 18 and 25 years, at prepregnancy (mean age 30 years at inclusion) and at 3 months postpartum. Body height was measured to the nearest 0.1 cm using a fixed stadiometer at inclusion. At the same visit, the participants recalled their weight at the age of 18 and 25 years (if older than 25 years) and at prepregnancy. At 3 months postpartum, Tanita-weight BC-418 MA (Tanita, Tokyo, Japan) was used to measure weight in light clothing without shoes in a fasting state. The participants provided information on ethnicity and other background variables at inclusion. Ethnicity was defined by the participant’s country of birth or mother’s country of birth if the mother was born outside Europe or North America. This definition recognises both the biological and cultural aspects of the ‘second generation of migrants’ and the importance of the maternal line in transferring cultural, language and dietary habits to their children, and is commonly used in epidemiological research on ethnic minorities with migrant background.33 Ethnicity was categorised into six broad groups: Western Europe (including North America), Eastern Europe, Middle East (including North Africa and Central Asia), Africa (except for North Africa), South Asia and East Asia. Western European women were used as the reference group (94% born in Norway). Age was used as a continuous time-dependent variable: age is 18 years for time 1, 25 years for time 2, age at inclusion for time 3 and age at inclusion plus 1 year for time 4. Parity was dichotomised to 1 (primiparous, ie, the present delivery was the first) and ≥2 (multiparous). Duration of residence in Norway was dichotomised to <2 years (recent migrants) or ≥2 years among women who were not born in Norway. The construction of the current and the early life socioeconomic status scores has been described previously in detail.34 Briefly, a principal component analysis was used to construct each socioeconomic status score component. The final component for current socioeconomic status was dominated by five variables: occupation, educational level, tenure (owning vs renting), level of household crowding (persons in household per room) and employment status (not paid work vs paid work outside of home), and named ‘socioeconomic status score’. The mean (SD) socioeconomic status score was 0 (1), with values ranging from −2.9 (lowest position) to 2.6 (highest position). The variables used to construct the early life socioeconomic status score were family occupational class (highest of mother or father), rooms per person in household and family ownership of car when the participant was 10 years old. The percentage of missing data was 19.7% for postpartum BMI due to loss to follow-up, but only 3.8% for BMI at the age of 18 years or 25 years, 1.5% for prepregnancy BMI and 0.5% for socioeconomic status score. The missing data were imputed using multiple imputation.35 We used fully conditional specification, an iterative Markov Chain Monte Carlo method to impute the data by running 50 imputations. Patterns of missing data were first analysed to inform the imputation model. The missing data were assumed to be missing completely at random. The following variables were associated with higher odds for having missing data for at least one of the BMI variables: ethnicity, age at inclusion, parity, weeks’ gestation at enrolment, current socioeconomic score and socioeconomic score in early life. All these variables were used to impute missing data in the same variables in the dataset. For women under 25 years of age at inclusion, BMI at the age of 25 years was set missing by default. Results based on the pooled data of 50 imputations are reported. The imputed data analyses are reported as the primary analyses and the complete data analyses as secondary analyses. The descriptive results are presented as means and SD or as numbers and percentages. Cross-sectional analysis of covariance was first used to examine ethnic differences in mean BMI, adjusted for age at inclusion, at each of the four time points and by parity. As the pooled analyses did not give p values or 95% CIs for differences in means between Western European women and the other groups, statistical significance of the differences was assessed based on 95% CIs of the means of each group, non-overlapping CIs indicating a statistically significant difference between the comparison groups. Next, linear generalised estimating equations (GEE) were fitted to explore ethnic differences in changes in mean BMI from 18 years of age until 3 months postpartum. The independent correlation structure, which had the smallest quasi-likelihood independence criterion in preliminary analyses, was used. The main model included BMI at the four time points (18 years, 25 years, prepregnancy and 3 months postpartum), ethnicity, time (values 1 to 4), the interaction term ethnicity×time, and was adjusted for age as a time-dependent covariate. The secondary models were additionally adjusted for either current or early life socioeconomic status score, as these variables were associated with BMI and varied by ethnicity in our data. A statistically significant interaction (p<0.001) was observed for ethnicity×time×parity in preliminary analyses, suggesting that parity modifies ethnic differences in BMI change. Therefore, the analyses were stratified by parity (primiparous vs multiparous). The role of multiparity was explored in more detail by restricting the analysis to multiparous women and adjusting the GEE model for age as a time-dependent covariate and parity as a continuous variable. The results of the GEE models are presented as regression coefficients (β) with 95% CI. The data were analysed using the SPSS statistical software package V.23.0. Table 1 shows the participant characteristics. The mean age at inclusion ranged from 28 to 31 years across ethnic groups. The mean socioeconomic status score was higher among Western European women than in the other ethnic groups. The percentages of women with ≥2 previous deliveries were highest among African, Middle Eastern and South Asian women. Western and Eastern European women were tallest and East Asian women were shortest on average. The percentage of women born in Norway was 89% among Western European women and varied from 2% to 21% across the other ethnic groups. Of women not born in Norway, the percentage of recent migrants (<2 years in Norway) varied from 11% to 23% across ethnic groups. The mean age-adjusted BMI is illustrated by ethnicity at each time point, separately for primiparous and multiparous women in figure 1A,B. Among primiparous women, the Western European reference group had a mean BMI of 22.1 kg/m² at the age of 18 years. South Asian women had a lower mean BMI than the reference group at 18 years and 25 years of age and East Asian women at prepregnancy. Other than that, none of the ethnic groups differed statistically significantly from the reference group at any of the four time points. Among multiparous women, the mean BMI was 21.8 kg/m² at the age of 18 years in the reference group. South Asian and East Asian women had a lower mean BMI at 18 years of age and East Asian women also at 25 years of age compared with the reference group. On the other hand, Middle Eastern multiparous women had a higher mean BMI at 25 years of age, prepregnancy and 3 months postpartum, and African women had a higher mean BMI at prepregnancy and 3 months postpartum than the multiparous reference group. 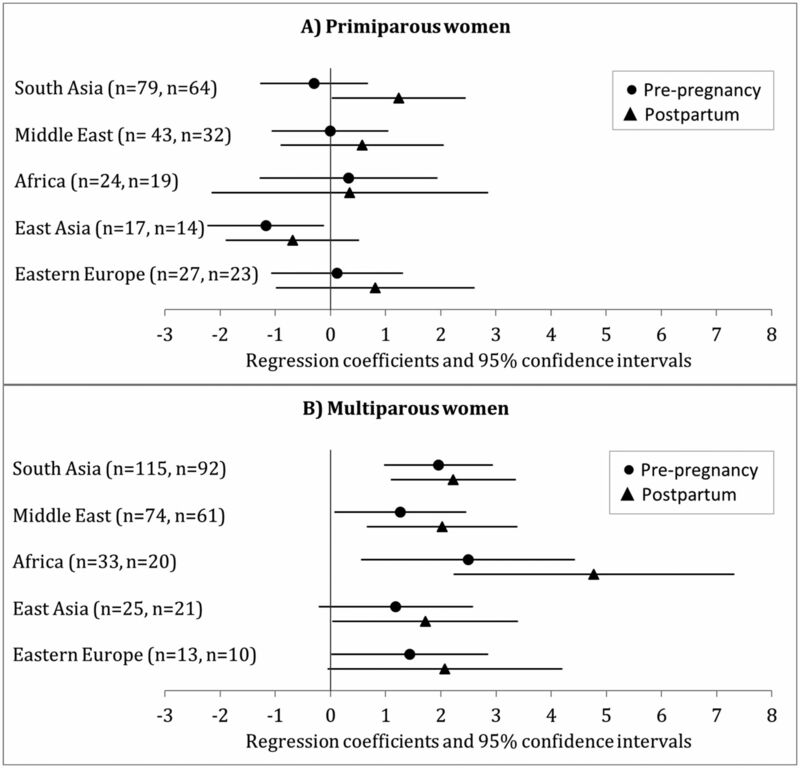 The results were similar in the complete data, except that the differences were not statistically significant for primiparous East Asian women and for multiparous African women at prepregnancy (data not shown). Missing data imputed: mean BMI (kg/m²) from 18 years to 3 months postpartum across ethnic groups among primiparous (A) and multiparous women (B), based on analysis of covariance adjusted for age. Arrows indicate statistically significant differences compared with WE. A, Africans; BMI, body mass index; EA, East Asians; EE, East Europeans; ME, Middle Easterners; Pre-p, pre-pregnancy; PP, postpartum; SA, South Asians; WE, Western Europeans. Figure 2A,B show differences in changes in the mean BMI from the age of 18 years to prepregnancy and to 3 months postpartum in each ethnic minority group compared with Western European women, adjusted for age. The following differences were statistically significant based on the 95% CIs. 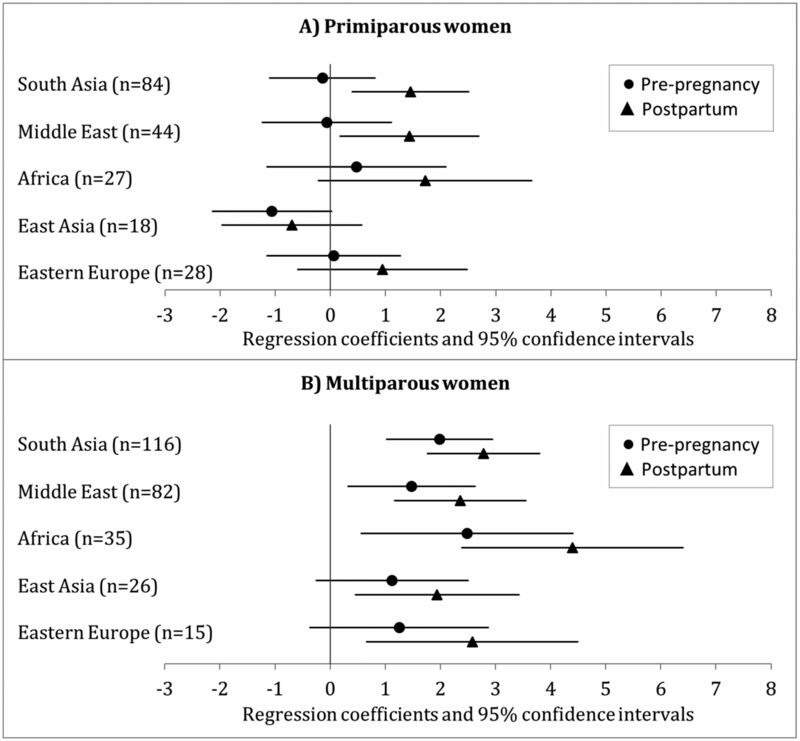 Concerning primiparous women, the BMI change from 18 years to postpartum was 1.45 kg/m2 higher in South Asian women (p=0.008) and 1.43 kg/m2 higher in Middle Eastern women (p=0.027) compared with the reference group. Among multiparous women, the mean increase in BMI by prepregnancy was 1.99 kg/m2 higher in South Asian women (p<0.001), 1.48 kg/m2 higher in Middle Eastern women (p=0.013) and 2.49 kg/m2 higher in African women (p=0.012) than in the reference group. By postpartum, the mean BMI had increased by 4.40 kg/m2 more in African women (p<0.001) and 1.94–2.78 kg/m2 more in the other ethnic minority groups (p=0.011 to<0.001) compared with the reference group. Missing data imputed: changes in the mean body mass index (kg/m²) from the age of 18 years to prepregnancy and to 3 months postpartum in each ethnic minority group compared with Western European women among primiparous (A) and multiparous women (B), regression coefficients and 95% CIs based on generalised estimating equations adjusted for age. The secondary analysis based on the complete data yielded mainly similar results as the primary analysis, although there were a few minor differences in the statistical significance of the results (figure 3A,B). The coefficients were generally very similar to those based on the imputed data. Complete data: changes in the mean body mass index (kg/m²) from the age of 18 years to prepregnancy and to 3 months postpartum in each ethnic minority group compared with Western European women among primiparous (A) and multiparous women (B), regression coefficients and 95% CIs based on generalised estimating equations adjusted for age. The numbers of women refer to the prepregnancy and the postpartum analyses, respectively. When restricting the analysis to the multiparous women and adjusting for age and parity (as a continuous variable) in the GEE model with imputed values, the results were practically the same (data not shown) as the results observed among multiparous women when adjusting for age only (figure 2B). When the GEE model was adjusted for age and current socioeconomic status or age and early life socioeconomic status, the results were very similar to those adjusted for age only both among primiparous and multiparous women (data not shown). To our knowledge, this is the first study to explore ethnic differences in long-term BMI trajectories among women living in a European country. Our main finding was that ethnic differences in long-term weight development differed by parity in this multiethnic cohort of pregnant women. The mean changes in BMI were mainly similar across ethnic groups for primiparous women. In contrast, among multiparous women the mean BMI increase was higher between age 18 up until the current pregnancy in African, South Asian and Middle Eastern women than in Western European women. Further, in multiparous women, BMI increased more from 18 years to postpartum in all ethnic minority groups, compared with Western European women, most pronounced in African women. Results based on the complete data were essentially similar. Our study has several strengths. We used data from a multi-ethnic population-based cohort study of pregnant women which had relatively high participation rates in each ethnic group (63%–82%) and was representative of pregnant women attending child health clinics in the study districts.32 The study questionnaires were available in nine different languages and professional interpreters were used when needed. Multiple imputation supported the plausibility of the missing completely at random assumption. The result for multiparous women were also adjusted for parity in additional analyses. The main limitation of the study is possible misclassification of body weight at the age of 18 and 25 years and prepregnancy, which were retrospectively self-reported. Prepregnancy weight may have been recalled more accurately as it was reported immediately after measuring body weight at the first visit during pregnancy and it correlated very strongly with the measured weight (r=0.95–0.97 in all ethnic groups).21 However, a review on the validity of self-reported prepregnancy weight36 reported that black women had higher reporting errors than white women in the USA, although this is not generalisable to the ethnic minority groups in Norway. Furthermore, there may be ethnic differences in the validity of self-reported body weight at 18 and 25 years of age. We are not aware of any study assessing ethnic differences in the validity of body weight data that is self-reported several years retrospectively. On the other hand, our results on ethnic differences in BMI at different ages are in line with other studies from Norway (see the next paragraph), underpinning the validity of our data. Nevertheless, if under-reporting of earlier body weight was more common among groups that had highest mean BMI (multiparous African and Middle Eastern women), our estimates of ethnic differences in long-term changes in BMI would have been slightly overestimated and the cross-sectional differences in the earlier time points would have been slightly underestimated. Another possible limitation is that we were not able to use socioeconomic status as a time-dependent covariate in the analyses. Additionally, the numbers of women were rather small in the African, East Asian and Eastern European groups, which made it more difficult to observe statistically significant differences between these groups and the Western European reference group. In a multiethnic population in Norway, ethnic differences in long-term BMI trajectories in women seem to widen after the first pregnancy. Few ethnic differences were observed in weight development among women who were expecting their first child. However, multiparous women in all ethnic minority groups gained more weight from the age of 18 years until 3 months after delivery than multiparous Western European women, suggesting that pregnancies and postpartum periods may be the most susceptible periods for excessive weight gain in these groups. Adjustment for the number of previous pregnancies did not change the results. The results of the study could be generalised to other women in these ethnic groups living in Norway and possibly also in other European countries with the same migrant groups. Future studies and interventions are needed to promote healthy diet and physical activity and find tools for successful weight management among young women from ethnic minority groups.
. Maahanmuuttajataustaisten nuorten terveys ja hyvinvointi. In: Tutkimus pääkaupunkiseudun somali-ja kurditaustaisista nuorista [Health and well-being of adolescents with immigrant background. Study on adolescents with Somali and Kurdish background in capital city area. 17th edn. Helsinki: National Institute for Health and Welfare, 2014.
. Does acculturation affect the dietary intakes and body weight status of children of immigrants in the U.S. and other developed countries? A systematic review. Ethn Health 2017;13:1–21.
. Migration, ethnicity, race, and health in multicultural societies. 2nd edn. Oxford, United Kingdom: Oxford University Press, 2014. World Health Organization. Waist circumference and waist-to-hip ratio: report of a WHO expert consultation, Geneva. Geneva: WHO Document Production Services, 2008. Contributors TIK, KRR, LS, LT, CS, CWW, IM and AKJ participated in formulating the research question. AKJ and LS designed and carried out the study. TIK, KRR and IM analysed the data. TIK, KRR, LS, LT, CS, CWW, IM and AKJ participated in writing and revising the article and accepted the final version of it. Funding The data collection was supported by the Research Council of Norway, the South-Eastern Norway Regional Health Authority, Norwegian Directorate of Health and collaborative partners in The City of Oslo, Stovner, Grorud and Bjerke administrative districts. Ethics approval The study protocol was approved by the Regional Ethics Committee (2007/894) and the Norwegian Data inspectorate. Data sharing statement The datasets analysed during the current study may be available from the principal investigator (Anne Karen Jenum) on reasonable request.